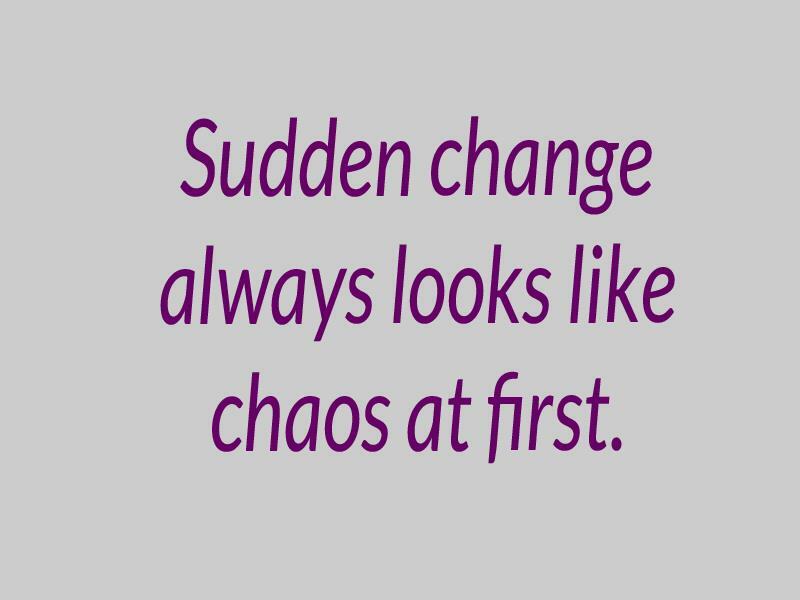 Sudden change always looks like chaos at first. We don’t like change. It’s not comfortable. It upsets our balance. We do everything we can to avoid it. Fear takes us into the past. We feel sad wishing things would go back the way they used to be. Imagining how this change will bring bad things in our future makes us anxious. We feel horrible. Talking to some one who is miserable and understands our situation brings temporary comfort. The more we talk and think about what we don't want the worse we feel. What we really want is to feel better. We want to know everything is going to be ok. We want to know that whatever happens we will be just fine. How do we get from feeling so bad to feeling better? I don’t have all the answers but... I can share what I am learning from my constantly changing sight. Learn to live through the change. Let go of how things used to be. Things are different now. Stop imagining a future you don’t want. Focusing on the past and future keeps you stuck in the situation. It only makes you feel worse. Emotions are energy passing through. They need to get out of you. Holding them in makes you sick. Allow yourself to feel them. Learn from your emotions. If you feel bad you are most likely focused on past or future. Focus all your attention on the situation just as it is now. Find ways to adjust to the change. Look for solutions to help you. Avoid thinking nothing can be done. There might be options you never knew existed. Be open to whatever comes to you. Try different things to find what works. It is a moment by moment practice. Notice how your thoughts, words and actions shift your mood. Choose thoughts, words and actions that feel better. Deliberately changing my thoughts, words and actions helps me relax. Allowing myself to feel I become more loving and compassionate with myself. I can let the change make me feel horrible and hopeless or I can choose to create inner peace, love, joy and harmony while living through the change. It takes moment by moment practice but I like feeling better.